Did you know that oral cancer is the sixth most common cancer, accounting for 40,000 newly diagnosed cancers each year? As part of Dr. Paul Mathew‘s comprehensive dentistry services, he and and his dental team will perform free oral cancer screening and thorough oral examinations during your routine check-ups, in an effort to catch oral cancer early, and provide our patients with peace of mind. Oral cancer often starts as a tiny, barely noticeable white or red spot or sore anywhere in the mouth. It can affect any area of the oral cavity including the lips, gum tissue, cheek lining, tongue, and the hard or soft palate. If you’ve located a spot in your mouth you’d like a second opinion on, or if you’re simply due for a complete oral health check-up and oral cancer screening, please contact our Salem, New Hampshire or Newburyport, Massachusetts offices today. 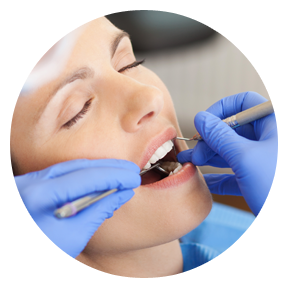 Our skilled dentist and staff will perform free oral cancer screening and examinations during your routine check-ups.